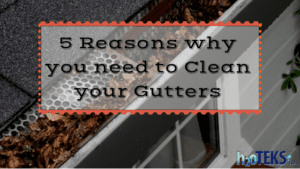 5 Reasons To Clean Your Gutters - h2oTEKS Ltd. Though it may sound like a daunting task, getting your gutters cleaned out is one of the most essential ways for keeping your house in proper condition. After all, you have scheduled house cleaning where you wash the floors and sweep the yards, yet the gutters are often ignored. Avoiding this maintenance need will just provide problems caused by the debris piling up from the gutters. When these things build up, you may be surprised by the chain reaction of potential damage that is certain to occur. If you are not confident or just don’t like the danger of the DIY cleaning, then it’s better to look for a professional service of h2oTEKS and get it done the right way. But, if you wait till you see weeds growing in your gutters, then you’ve waited way to long. Listed below are the 5 common reasons why you need to have your gutters cleaned out regularly. Basically, the part of your house that is commonly affected by dirt, leaves and debris is the roofing. If this debris clogs the gutters, the water will be stagnant, causing it to flood over. When this continues, rot will form and inflict damage on your roofing. Insects having a feast on your roofs! They are attracted to the wet and damp places, making your clogged gutters a perfect room for them. They will live and breed in it as they treat it as a good nesting site. These pests can range from mosquitoes, flies and other insects, and even birds. Not just roofs, but leaving your gutters devoured by moisture and other elements will damage the fascia. This is the board that covers the area where the wall meets the roof. The water that overflows from the gutter will disrupt the essential components of the entire gutter system. Clogged and congested gutters cause the water to spill over the side. This falling water can erode and wash out the landscaping and mulch you have near you house. You have put a lot of effort into the landscaping, don’t let it just erode or wash away! Again, overflowing water presents many problems. If this reaches the foundation of your house, it can freeze and weaken the area and then create potential cracks and damage. Also, consider that clogged gutters are carrying a great amount of weight which will eventually cause issues to the brackets. There are many reasons you need to have your gutters cleaned regularly, because damage from those clogged gutters is undeniable. But equally as certain, is the level of professional service you will receive from h2oTEKS. Reach to us today: h2oTEKS.com – info@h2oteks.com – 724.909.0173 – REQUEST A FREE ONLINE QUOTE TODAY!